Stabilization of mechanical systems by shaping their energy function is a well-established technique whose roots date back to the work of Lagrange and Dirichlet. Ortega and Spong in 1989 proved that passivity is the key property underlying the stabilization mechanism of energy shaping designs and the, now widely popular, term of passivity-based control (PBC) was coined. 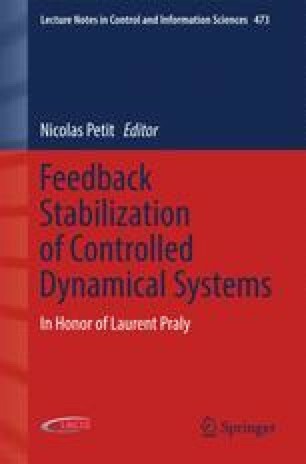 In this chapter, we briefly recall the history of PBC of mechanical systems and summarize its main recent developments. The latter includes: (i) an explicit formula for one of the free tuning gains that simplifies the computations, (ii) addition of PID controllers to robustify and make constructive the PBC design and to track ramp references, (iii) use of PBC to solve the position feedback global tracking problem, and (iv) design of robust and adaptive speed observers. R. Ortega is supported by Government of Russian Federation (grant 074-U01, GOSZADANIE 2014/190 (project 2118)), the Ministry of Education and Science of Russian Federation (project 14.Z50.31.0031). The work of J.G. Romero is supported by a public grant overseen by the French National Research Agency (ANR) as part of the Investissement d’Avenir program, through the iCODE Institute, research project funded by the IDEX Paris-Saclay, ANR-11-IDEX-0003-02.